Align with the magical energy of the harvest moon with one of these simple celebration ideas. The harvest moon is the full moon closest to the Fall Equinox. It’s a time of gratitude, when the expansive harvest energies of the year are at a luminous peak. Here are 5 harvest moon activities that will help you align with the powerful energies of this magical time. On the evening of the harvest moon, go out in nature or create ambiance with some candles, a fire pit, and/or some incense evocative of fall. Then put on a playlist or Pandora station specifically created to open your heart in gratitude to all the many blessings you presently have in your life, from clean water to a comfy bed to beloved friends and family – and even the little things like your favorite coffee mug or fuzzy socks. Then move on to a playlist or Pandora station specifically created to tune you into the expansion you’d like to experience. For example, when you release the expectation of lack or the belief that you don’t deserve abundance, how do you feel? Find music that helps you feel that way. Then dance to celebrate opening up to even more of the beautiful blessings the Universe so dearly desires to shower upon you. If you’re celebrating the harvest moon with friends, place a bottle of mead in the center of your circle and collectively send love and gratitude into it. Perhaps finish by saying something simple together to summarize, such as, “We are grateful for all the sweetness life has to offer. We bless this mead with our friendship and the light of the harvest moon.” Then share. As an alternative to the mead, try these insanely delicious pumpkin pie martinis. (Although I personally like to do 1 ounce vodka per martini rather than 2.) Last fall, these were my go-to fall celebration cocktail: harvest moon, Mabon, Samhain, and even Thanksgiving. They’re convenient because they double as a dessert. Could there be a better day to decorate for fall than the harvest moon? This year, consider creating your own decor as an expression of your gratitude for your blessings and pride in your accomplishments. 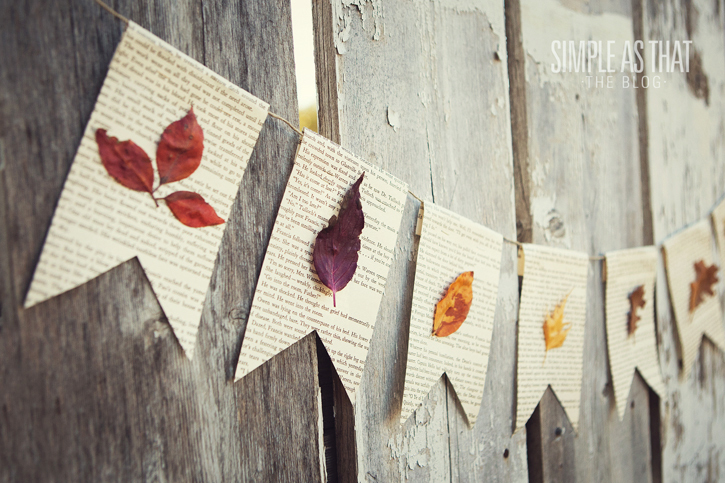 Like possibly these gorgeous candle holders, this super simple and cheerful garland, or this pretty bunting (pictured). Brightest blessings on this magical night. You may also like this free guided Fall Equinox and Harvest Moon Meditation. Great ideas! I’ll try some, but no alcohol here (we’re helping somebody close to our heart to recover from alcohol addiction). Thanks and Blessings! Raquel, thanks for reading! Yes, of course the alcohol recommendations aren’t for everyone. I am only in the mood for it on occasion myself.